I always love seeing the what's in my bag posts, mostly because I'm nosey, but also because I like to see if there is something that I'm totally forgetting to carry around with me. I never really hold too much in my regular bag since I'm at school 5 days a week and then only switch over my wallet to a small bag and that's it. 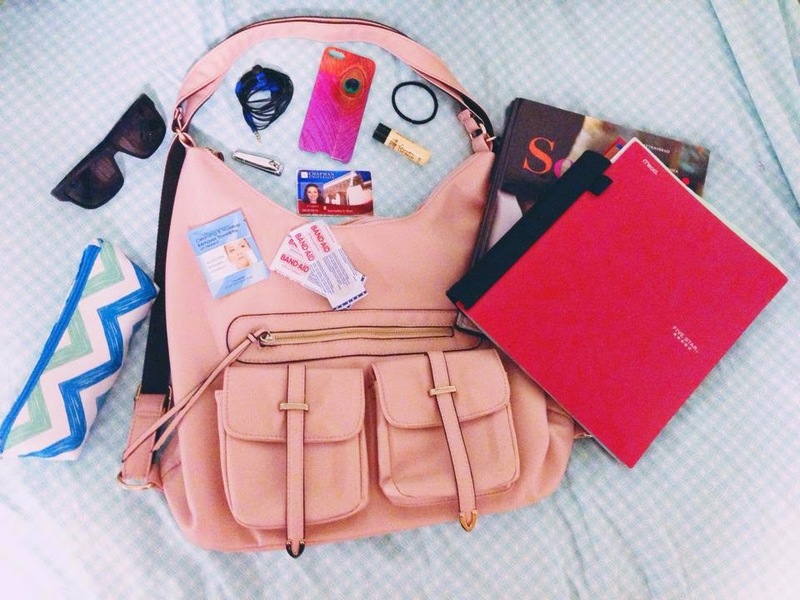 But I figured I'll show you what's in my bag that I use for school! I got my bag from a small store in Lake Tahoe that I honestly don't remember the name of, but it can go from a purse to a backpack in seconds! It's got a lot of room so I can hold all the books and notebooks I need for class plus all my other necessities! Wallet: It isn't included in the picture because I forgot to put it in there, but it's my most important item. As I would think it would be for most people? It's a Kate Spade Cobble Hill Stacy and is the same exact color of the bag (yay matching!) but is no longer available, although I found a similar one (currently on sale!!!) in the same color! I transfer it to every bag I use and always have it with me. I would be extremely lost without it. My school ID is always in there, and that's how I get in and out of my dorm, how I get food on campus, etc! Notebook: I use 2 three subject notebooks which is great since I am taking five classes at the moment. I only have max three classes in a day so just bring one of the notebooks with me and I'm set. I love the Five Star ones because they give ample note taking space and also have pockets at each separator. Textbook: In the picture I have my Italian textbook because it's really the only book I have to take to class. All my other books stay in my room, but we're required for language classes to have the book with us nearly every class. Let me tell you, it's heavy and awful. Pencil Case: I've always used makeup pouches in place of a pencil case because they have better designs by far. Also, the lining on the inside of a makeup case protects my bag from getting destroyed if a pen happens to leak. Pencil cases are definitely not as protective on that part. I got mine from target, and I'm loving this one that they have right now. Sunglasses: I actually got the ones pictured for free when I tested them out as a new product. They're from Spy Optic and have "happy lenses" that use the sun's rays to give you a more positive attitude. I'm not sure if I feel happier wearing them or not, but they are definitely great for the Southern California sun and for driving around. I tend to get blinded by the sun any time I get in my car, so these are lifesavers. These are super high quality and durable and if you're looking for a new pair of sunglasses I would recommend them! iPhone: Obviously. I used my phone to take the picture, but took off the case so you would see that it was included. Again, another necessity. Unfortunately it's no longer available. Chapstick: I'm so addicted to applying chapstick it's ridiculous. A couple years back I was introduced to the Lemon Lip Balm from Bath and Body Works and loved it. Every so often (like right now!) they do a buy 2 get 1 free for them, and I stock up! My parents also give a bunch of them to me for christmas. Seriously amazing stuff. Headphones: I love skull candy headphones. I normally find them at TJ Maxx or Marshalls for pretty cheap, and get them every two years or so. They're one of the few earphones that don't hurt my ears. I'm one of those people who can't use apple headphones! Nail clippers: I always seem to get hang nails at the worst time, and all throughout high school I carried a pair in my backpack. I decided to do the same in college, and it's one of the most useful things in my bag. Band Aids: Just a good idea, you'll never know when you or someone else will need one. Hair Ties: Again, you never know if you or a friend will need/want one, so it's best to just carry a few around. Makeup Remover: Sometimes you have those moments where your makeup gets smudged or your eye waters and mascara runs down your cheek. In those moments it's good to have a small makeup wipe to clean up those little mistakes quickly!